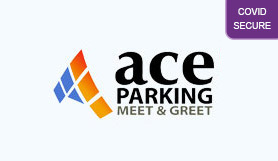 ACE Meet and Greet service lets you drop your car off with a uniformed chauffeur outside the terminal, so you can just walk inside and board your flight while your car is parked in a secured car park away from the terminal. When you get back, your car will be waiting where you left it with your chauffeur ready to hand back your keys. It's the best way to park at Birmingham airport. Disabled facilities: This parking service is perfect for disabled customers as there is no need to get a transfer bus. Please ring Ace Airport Parking on the number on your confirmation email, 15 to 20 mins before arriving at the Airport. When you arrive at Birmingham International Airport, stay in the right-hand lane and follow it all the way to 'car-park 3 Valet Parking'. Go through the barrier and collect a ticket to hand to Ace Chauffeur. Park your vehicle in the designated ACE / Maple Manor Parking bays and a uniformed chauffeur with ID will be there to collect your vehicle. Once You have collected your luggage, Please Call Ace Airport Parking using the number on your confirmation email. As you exit the terminal building, follow the signs to car park 3 Valet Parking (where you dropped the car off). Your vehicle will be returned to the designated Maple Manor Parking bays. A uniformed chauffeur will return your vehicle.
. Please be aware that due to time restrictions in the car park you must be at the collection point within 10 minutes of your call, or you may incur additional charges payable at the exit barrier.
. If you are returning earlier than the date or time you have provided, we must know 24 hours in advance to avoid any delay.
. From time to time the meeting point may change at short notice. You will be informed when you call if this will affect you.